On May 13, 2007, Chess Corps hosted the Chess Studio on the Hill Year-End Party and Awards Ceremony. To mark the occasion and to reward the students, parents and staff for a productive season, Chess Corps treated its members to a delightful performance by a talented violinist from the New England Conservatory. The year-end party featured an afternoon of new and challenging chess activities with a special emphasis on teamwork and cooperation, including "Musical Chess" and "Relay Chess", created by Chess Corps Chairman, Eric Cushing. Please join us from 4:00 PM to 7:00 PM on December 29 for First Knight, a special chess event hosted by the Carlisle Chess Club! Learn and play with Chess Corps leaders, International Chess Master, Satea Husari and Chess Corps Chairman and Benefactor, H. Eric Cushing! This free event will be held at Union Hall, Unitarian Church (27 School St., Carlisle Center). Please click here for directions. If you are interested in attending , please RSVP to the Carlisle Chess Club. 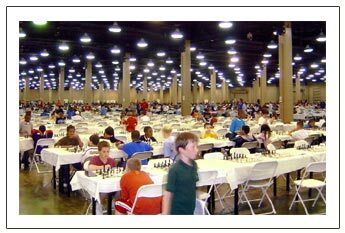 On April 8, 2005, a team of talented Chess Corps players led by Chairman Eric Cushing and Director of Chess Education, Valery Frenklakh, traveled to Nashville, TN to participate in the 2005 Supernationals Chess Championship at the Gaylord Opryland Resort and Convention Center. The Chess Corps players emerged from the tournament having learned valuable chess lessons, having gained competitive experience, and having strengthened their sense of team unity. Below are articles written by Chess Corps members regarding their experiences at SuperNationals.